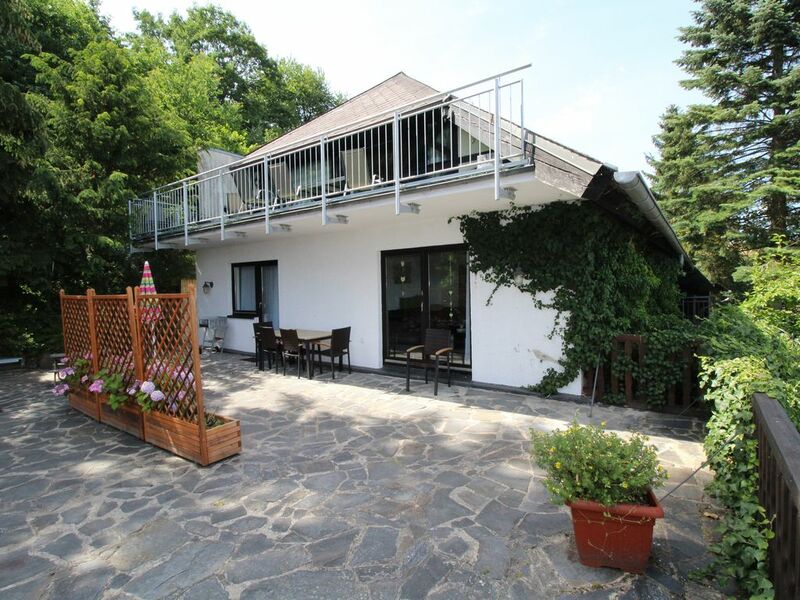 The cottage Eifel nature lies in the idyllic Vulkaneifelort Immerath, nestled between two Maaren, the Immerather Maar and the Pulvermaar. The house is located in the outskirts surrounded by green fields and trees. The large property around the house with tall trees and seating in the countryside offers the ideal atmosphere for rest and relaxation to find. Since the access road is a dead end with no through traffic, the holiday is also ideal for families with children find plenty of space to play and run. In the immediate vicinity of a mountain bike trail goes past, the Maare-Moselle bicycle route is just 4 km away. Round there are numerous trails for hiking or walking. The spacious apartment EifelNatur 4 "Immerather Maar" is classified by the DTV and is certified with 4 stars. It has 5 beds in 2 bedrooms, one with wash basin, a spacious bathroom, kitchen, hallway and living room. The exposed south-facing terrace with barbecue and garden seating invites you to linger and enjoy. On the community terrace behind the house you will find a ping pong table and a children's playground with swings, slide and climbing frame and seating. The Vulkaneifel offers some beautiful maars. The two nearest are within walking distance: the "Immerather Maar" is a nature reserve, the "Pulvermaar" offers a bathhouse, restaurant and a boat rental. The place Immerath offers a "trail of the senses" and a school museum in probably the oldest schoolhouse of the district Vulkaneifel. The area offers a lot of nature to find peace and relaxation, hiking, cycling and mountain biking. The Vulkaneifel offers some beautiful maars. The two closest ones are within walking distance: the 'Immerather Maar' is a nature reserve, the 'Pulvermaar' offers a bathhouse, restaurants and a boat rental. Two zoos, the 'Game and Adventure Park Daun' and the 'Eagle and Wolf Park Kasselburg' are interesting destinations as well as the 'Nürburgring' and cities such as Cochem, Trier or Luxembourg. For a really good start to your day, our morning bread service provides: We deliver the desired rolls - deliciously fragrant, fresh and crispy. In the next building you will find an information wall with brochures about activities in the area. Perfect location for walks in the nearby countryside. Beautiful views looking out over the town and surrounding hills. Fantastic apartment and wonderfully equipped...everything you need for cooking complicated meals. The owners communications were timely and respectful. I can highly recommend this holiday flat for those looking for quiet evenings and healthy walking / biking excursions. Zeer mooie, goed uitgeruste woning! Sehr ruhige Lage. Toller Service. Es war sehr schön im idyllischen Immerath. Die Maare sind einen Blick wert und auch Informationen über deren Bildung sind sogar im haus zu finden. Wir waren zu viert da, hatten das Gelände für uns allein und den Urlaub genossen. Die Wohnung ist gut ausgestattet und die Gastgeber sind sehr nett, zuvorkommend und haben uns herzlich und mit Obstkorb wilkommen geheißen. Auch nett ist das Angebot an Getränken, Essen und eingemachten das für faire Praise im Haus auf Vertrauensbasis erworben werden kann. Schönes Highlight ist der "Partyraum" mit Sauna, Kicker und Billiardtisch. Die tolle Terasse konnten wir aufgrund des herbstlichen Wetters nicht wirklich nutzen, sieht aber verlockend für sonnige Tage aus. Alles in allem werden wir wiederkommen! Top für Familien und für Leute, die kein Ramba-Zamba wollen. Ruhige Lage, Gastfreiheit, gemütlich, komplett und sauber. Die Kurzbeschreibung oben ist zutreffend. Sehr schöne und ruhige Lage. Sehr geschickt für Ausflüge, Naturwanderungen direkt ab Haus. Sehr Kundenorientierte und gastfreihe Gastgeber. Das Haus ist sehr komplett, Zimmer sind sehr raum und alles war total sauber. Es hat uns an nichts wirklich gefehlt. Es gab noch Arbeiten an den anliegenden Wohnungen aber dies hat nicht wirklich gestört. Im Fazit: Top Ferienhau sund sehr schöne Umgebung wenn man die Ruhe sucht. Weshalb kein 5 Sternen? Es gibt immer kleine Sachen zur Verbesserung. The surrounding area offers plenty of nature to rest and relaxation to find, for children to play, walking, cycling and mountain biking. The Vulkaneifel offers some beautiful crater lakes. The two nearest are within walking distance of the 'Immerather Maar' is a nature reserve, the 'Pulvermaar' offers a bathhouse, restaurant and a boat rental. The place Immerath offers a "trail of the senses" and a school museum in probably the oldest schoolhouse of the district Vulkaneifel. Two animal parks, the 'wildlife and adventure park Daun' and the 'Eagle and Wolf Park' are interesting destinations like the Nürburgring and cities such as Cochem, Trier or Luxembourg. The Mosel is only 22 km away. Haustiere sind in unserem Haus Herzlich Willkommen! Wir berechnen eine Pauschale für den Reinigungsmehraufwand in Höhe von 15,00 EUR pro Tier und Aufenthalt. Bei Buchungen von 2 oder 3 Übernachtungen erheben wir einen Zuschlag in Höhe von 10%.